My first card uses image, paper and sentiment from Pink Petticoat and I've coloured it in with Promarkers. I used my sewing machine minus the thread to do some paper piercing around the edge of the mount. For my second card I used a piercing tool to create the bee's buzz behind it. The sentiment, Image and papers are also from Pink Petticoat. I have been at my daughter's all this last week and crafting was the last thing I was able to think about..but I was back on Friday and have a couple of quick cards to show you. This one uses two of the Framelits dies from Stampin' Up, mounted on dimensionals and with the lower shape pierced with a pokey tool. The image is from a cheap 99cents stamp set from Michael's in Palm Desert last year. 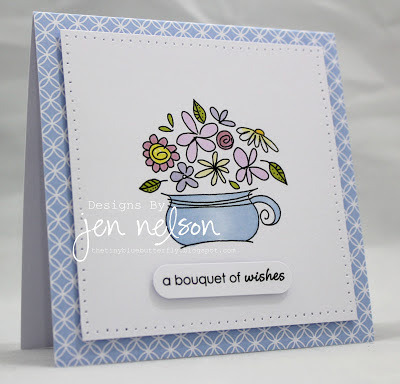 The sentiment is from Simon Says Stamp and both are stamped in Lucky Limeade ink. 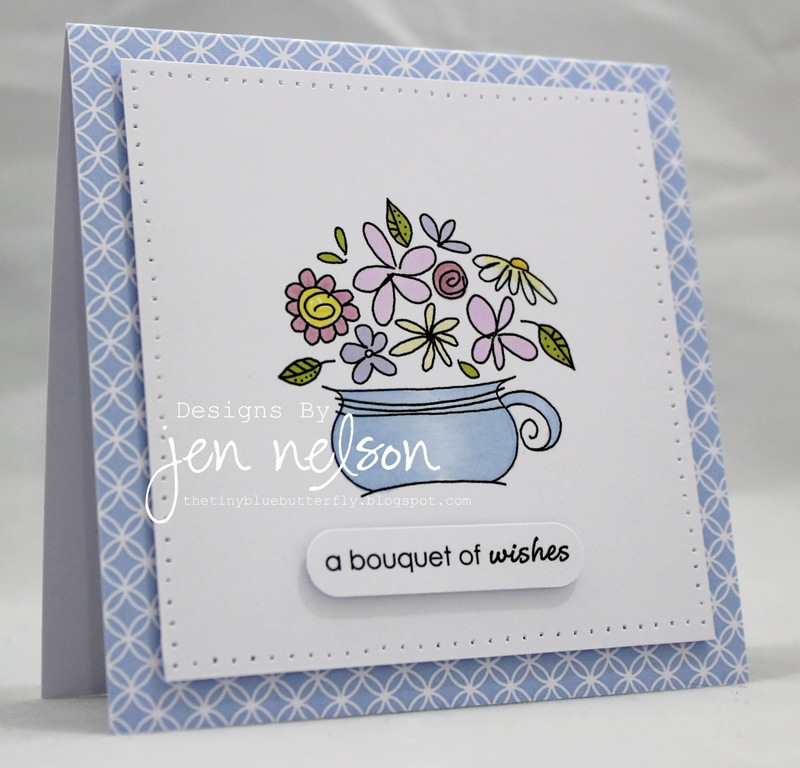 This one is a little stamp from Bloomin' Marvellous, one of SU's Salebration sets, stamped with Versamark and sprinkled with a variety of embossing powders. The lower circle was given a similar treatment, before the two circles were then pierced. The horizontal band was pierced with a little gizmo which you use in conjunction with a Scor Pal or Scor Buddy and it makes great perforations. The sentiment is also from the Bloomin Marvellous set. Please don't forget to try to visit some other participants in our challenge and leave them a friendly word... it means so much! Beautiful cards Jen. My fav is the last one. Fantastic. I'm so happy to have joined in again. Simply beautiful inspiration... ditto Dotty Jo's comment above! So many gorgeous designs, both from the DT and the other bloggers. Hope you'll all take pity on me - mine's more an account of "what went wrong" than anything else!!! Beautiful cards Jen and Chrissie; I especially love the embossing treatment on the last card. That turned out really lovely. Is it just me or is anyone else experiencing this issue? I'm having a cray-cray week, but you'll see I HAD to play in this one! I can tell by the entries that lots of others joined in the fun! Thank you for another awesome challenge and just amazing inspiration cards for us, Chrissie and Jen. I've got to dash off for a work emergency, but hope to visit your individual blogs, too. Mwah!